This is a group of formal portraits of the members of the 23rd Regimental Band. 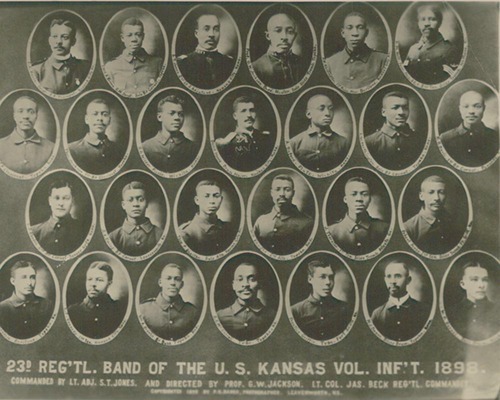 The band began in 1890 as Jackson's Dispatch Band of Topeka, Kansas, then enlisted during the Spanish-American War as the regimental band for the all-black 23rd Kansas Volunteer Infantry. The captions give their name, musical instrument, and hometown. Lieutenant Colonel James Beck was the regimental commander of the 23rd Regiment. The band was commanded by 2nd Lieutenant and Adjutant, Samuel T. Jones, and directed by Professor George W. Jackson. First row, left to right: Sergeant Elijah E. Davis, E flat trumpet, Kansas City, Kansas; Charles A. Brown, Quartermaster Sergeant, Solo B flat cornet, Topeka; Samuel T. Jones, 2nd Lt & Adjutant, Kansas City, Kansas; Professor George W. Jackson, band master, solo slide trombone, Topeka; Andrew W. Washington, 1st Principal Musician, baritone, Kansas City, Kansas; Samuel M. Holt, Principal Musician & C.T. 2nd Tenor Slide Trombone, Wathena. Second row: Unknown, E flat clarinet, Topeka; Thomas Jackson, 1st B flat clarinet, Topeka; Horace G. Wilder, piccolo, Wichita; Dana Moore, drum major, Kansas City, Kansas; Albert Buford, flute, Wichita; Leander W. Northington, solo B flat cornet, Topeka; Henry R. Davis, 1st B flat cornet, Parsons. Third row: Charles D. Rhodes, 2nd B flat cornet, Bonner Springs; Z. Van Ewing, B flat cornet, Leavenworth; Thomas P. Shelton, solo alto, Kansas City, Kansas; William Vaughn, 2nd Alto, Topeka; Jasper Thornton, 1st tenor slide trombone, Atlanta, Georgia; Robert Parks, 2nd tenor slide trombone, Ft. Scott. Fourth row: Hollie E. Searcie, baritone, Topeka; Lester F. Kennedy, 1st tenor, Kansas City, Kansas; William A. Brooks, B flat bass, Topeka; Simeon E. McCarroll, tuba, Topeka; Prentice Griffin, tuba, Fort Scott; Marcus J. Owens, snare drum, Topeka; Wallace Bernal.